BACKGROUND: Intragastric balloon treatment for obesity has been developed and it’s placement and removal techniques has been improved. Its primary objective is the treatment of obese people, who have had unsatisfactory results in their clinical treatment for obesity, despite of being cared for by a multidisciplinary team, and to prepare super obese patients with a higher surgical risk to a bariatric procedure. PACIENT AND METHODS: A 45 years-old obese male patient, who was going to be submitted to a heart transplant. 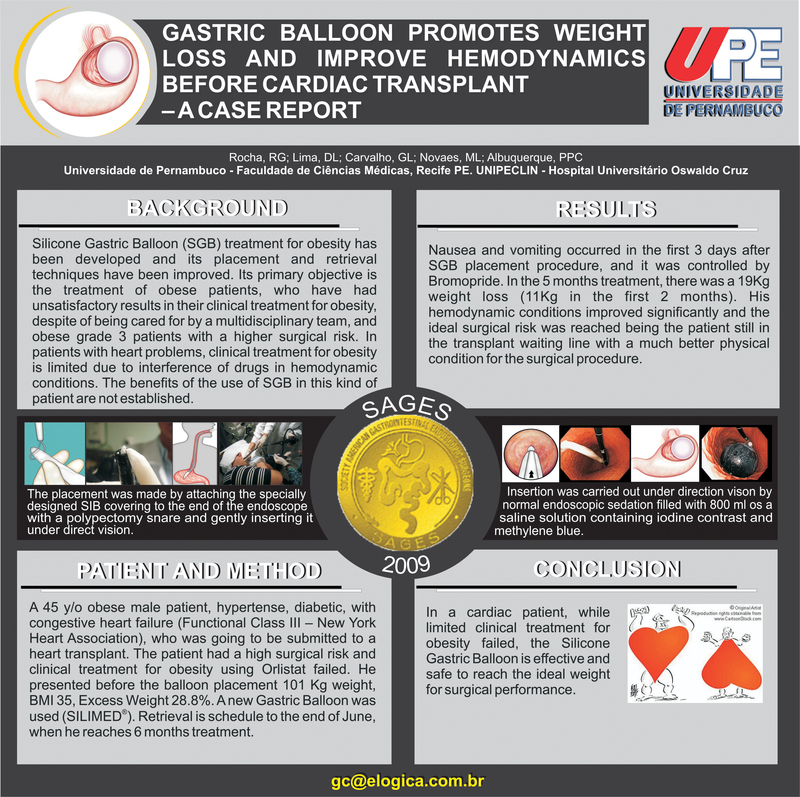 With a high surgical risk, the patient presented before the balloon placement 102 Kg weight, BMI 35 (obesity grade 2), Excess Weight 28.8%. A new silicone Intragastric Balloon (SIB) was developed (SILIMED®). The procedure was carried out by attaching the SIB covering to the end of the endoscope with a polypectomy snare and inserting it under direct vision in the stomach fundus. The SIB was filled with 800ml of a saline solution containing iodine contrast (20ml) and methylene blue 2% (10ml). Retrieval was made by positioning a double silicone overtube in the patient’s esophagus. SIB was perforated, and a catheter was inserted, draining the solution. The empty SIB was retracted by a near and inserted into the overtube and both were removed together, avoiding aspiration. RESULTS: The SIB was placed and removed without any complications. Nausea and vomiting occurred in the first 2 days after the placement. The patient lost 16Kg and became more suitable for the heart transplant, being actually in the waiting list. CONCLUSION: These novel techniques have made SIB placement and removal an office procedure, which is fast, safe, and cost-effective and it can also be useful to prepare obese patients for major surgeries – a heart transplant.